The world's most effective, easy, and affordable websites in the auto repair industry. With Sparkplug™ you don’t just get a website. You get the most advanced website solution available to the auto repair industry. We’ve reengineered web design from the ground up, creating the first universal website engine. This allows us to do some pretty amazing things underneath the hood of your beautifully designed auto shop website. 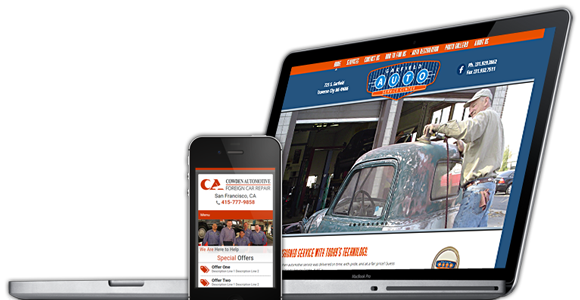 Our clients have the most advanced websites in the auto repair industry. We stay on top internet trends and automatically update your website seamlessly behind the scenes. Our client's websites outperform more than 95% of competing auto shops. With SEO, mobile compatibility, and so much more built in and always up-to-date, it's no wonder. Our engine is at the core of every website. This allows us to centrally measure effectiveness across every client and roll those successes into your website ...at no cost to you. Because the engine for your website is already built and ready to install, you save 80% over hiring a web designer. Not to mention the lifetime savings of never having to upgrade. It’s not enough to have a pretty website anymore. Your website needs to compel your visitors to act. That’s why every Sparkplug website is not just beautiful …it’s built on the science of how website visitors think and what makes them call your garage instead of moving on to your competitor’s auto shop website. Beyond our two decades of experience studying user interaction on the web, we constantly study how visitors engage with every Sparkplug website and build those successes into your own site. Best of all, these enhancements happen invisibly and automatically, without any additional cost to you or need for a redesign. You won’t find better quality, value, or service than you will with Sparkplug. Our websites come standard with what other web design companies charge hundreds or even thousands for. That could be why, in over three years of service, we’ve never lost a client that didn’t sell or close their auto shop. Our simple and effective designs are engineered to remove the barriers between you and your customers. Every Sparkplug website is customer-centered and engineered to make your phone ring. What good is a website if no one sees it? Our websites are built with a strong SEO core that helps you get higher rankings and more visitors to your website. We help your customers find you so you can keep your bays filled. Never lose a customer because they can't read your website. With as much as 50% of potential customers visiting your website from a mobile device, we've made sure that every Sparkplug website looks great on any screen. Don’t know what to say? We’ve already done that for you. You can take our professionally written content and leave it as is, adapt it to your hearts content, or use your own. Whatever the need, we’ve got you covered. Tired of paying for routine changes? Our interface makes updating your website a breeze. Or, just send us an email and we'll handle it for you. Over 95% of the updates we perform don't result in a client invoice. We don't just build a website and move on. We're here to partner in the success of your business. Whether you need a change to your site or simply want some marketing advice, just give us a call. We're here to help. Designed for auto shops, scientifically proven, ongoing improvements and upgrades. It would take over six years with us just to equal your upfront cost with other web design shops. 90-day guarantee, no set-up fees, no hidden fees, no contracts. We earn you business every day. Call us first, then the other guys! We’re so confident you’re going to love us, we’ll even give you the names of our closest competitors.